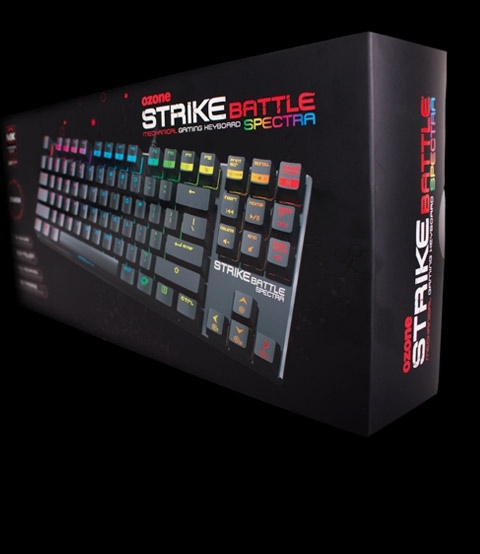 Ozone has renewed Strike series upgrading Strike Battle with RGB functions to fulfill the needs of the actual gamers and make it totally customizable; 16,8 million colors, 7 different lighting effects and color map profiles. Fast and reliable, Cherry MX is the most wanted switch amongst gamers thanks to its smooth touch and precise mechanism. Whether it’s audio or video you can instantly control volume, mute and other audio functions. The Game mode option will allow you to disable the windows key when you are in the middle of the action. Strike Battle Spectra`s compact size and ergonomic design is perfect for travelling. And thanks to its strong aluminum top case you will enjoy a long lasting and resistant keyboard, a weapon built for battle. To suit every game and gamer save your Macros on almost every key in 5 different profiles. Gaming Mode: Desactivation of Win Key. "El Ozone Strike Battle Spectra es quizás la alternativa de mayor relación calidad/precio para los que buscan un teclado compacto, pues partiendo de que incorpora interruptores Cherry MX y la nueva adición de iluminación LED RGB a estos, pocos teclados “tenkeyless” le hacen la competencia."